Small hotel with more than 100 years tradition. Hotel has 21 rooms with WC,Shower,Hair Dryer,Deposit Box,Satelite Tv,Telephone and internet connection. In the hotel you can to find two restaurants - Traditional Czech cuisine and Garden restaurant with specialties on the Grill. For your car we have big and safe parking. For business clients we have one small conference hall. The hotel Jerabek that ensued from an old former restaurant, which was until 1950 in the hands of a generation of Jerabek`s family. The restaurant was stored with excellent cuisine and nice Pilsen beer, that's why this place was very pleasant for Liben`s eminence people. This open air restaurant with a skittle-alley, was very inviting for a trip to a lot of Liben`s people. Restaurant saloons were the best places for an institutional meeting. 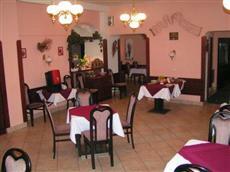 This family restaurant was represented by the Czech writer Bohumil Hrabal, who spend a lot of nice time here. In 1950 the restaurant was nationalized by RaJ Praha 8 and OPBH. The restaurant, managed by that department at that time had to close down and the building had to be demolished. The reason that the building was retained was the absence of money by the last government, at that time the building was without windows, roof and floor. Near hotel you can to find both bigger exhibition areas, bob-sleigh truck etc.